Fiat's revised Small architecture debuts with the 500L small minivan, shown, which goes on sale in Italy this weekend. BALOCCO, Italy -- The Fiat platform that underpins the Fiat Punto and Alfa Romeo MiTo subcompacts was revised so that it can underpin minivans, compact SUVs and crossovers, a company executive said. The platform, which Fiat calls Small, could underpin vehicles up to 4.4 meters in length and carry gasoline engines with displacements up to 2.4-liters, extending its coverage to the compact segment, Mauro Pierallini, head of product development for Fiat's Europe, Middle East and Africa regions, said. The revised Small architecture debuts with the 500L small minivan which goes on sale in Italy this weekend starting at 15,500 euros. Fiat will begin 500L sales in the United States next summer. "This architecture is designed for front-wheel-drive and for four-wheel-drive, the latter also for trail-rated eventual applications for the Jeep brand," Pierallini said at an event to launch the 500L near Milan. Fiat builds the 500L at its new plant in Serbia for Europe and North America. 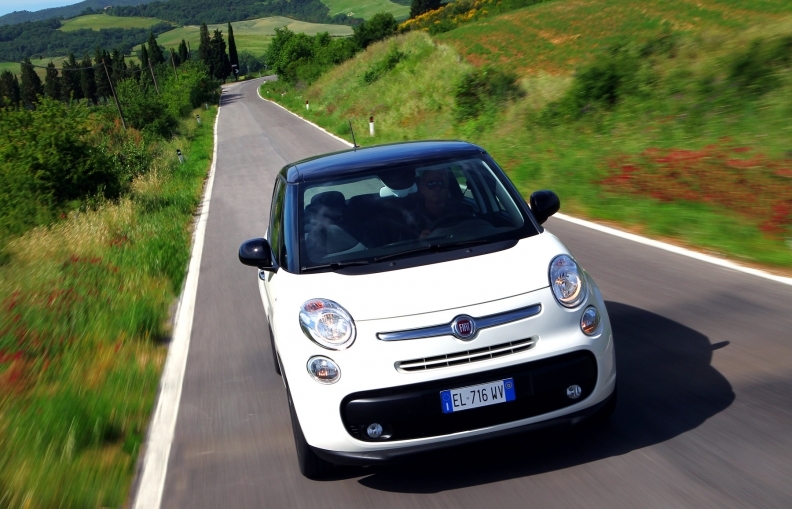 The 500L sits on a 2612mm wheelbase and is 4,147mm long. The Small architecture was developed to carry a wheelbase increased by up to 165mm and to reach 4,400mm in overall length. Pierallini declined to confirm that a single model set to replace the Jeep Patriot and Compass could sit on the revised Small architecture. Nevertheless, the fact that this architecture could use a 2.4-liter gasoline engine is a strong hint to a Chrysler future use. Fiat does not offer 2.4-liter gasoline engines on models built in Europe, while this is the exact capacity of Chrysler's Tiger Shark engine. An entry SUV for the Jeep brand, due in 2014, will also use Fiat's Small architecture. The still unnamed model, that Chrysler refers to as a B-SUV, will be smaller than the current Patriot and Compass models. Pierallini said the revised Small architecture is the first architecture that Fiat engineered from day one to be compliant with U.S. standards. The Mini architecture, which underpins the Fiat 500 minicar, was originally not compliant with U.S. standards. When Fiat decided to sell the model in North America, it had to invest 150 million euros ($195 million) for upgrading it to Federal requirement. Fiat invested 150 million euros to upgrade its Mini architecture, which underpins the Fiat 500 minicar, to meet U.S. standards. The 500 was introduced in Europe in 2007 and was not intended for sale in the United States, but after taking a controlling stake in Chrysler Group, Fiat decided to sell the car in the U.S and it launched last year. Fiat also modified its Compact architecture, first used for the Alfa Romeo Giulietta, for the United States. Chrysler Group now uses a heavily reengineered version called CUSW for the Dodge Dart. CUSW is 40mm wider than the Giulietta platform and can carry longer wheelbases and four-wheel-drive applications. Chrysler is expected to debut redesigned versions of the Chrysler 200 mid-sized sedan and Jeep Liberty SUV (called the Cherokee for Europe) based on a CUSW architecture at the Detroit auto show in January. Both will have a longer wheelbase than the Dart.